Rich "The Duke" Ward of Fozzy and Stuck Mojo fame met worship leader Terry Chism at Noonday Baptist Church in Marietta, Georgia, and after becoming part of the church's worship ministry himself, Rich decided to pursue a new musical project with Terry--one that "focuses on "focuses on contemporary rock styles, soaring vocal melodies, and bringing a positive message to a troubled world." With Christian rock bands such as Stryper and Skillet in mind, the two formed the band Walking With Kings and have released a self-titled debut album. 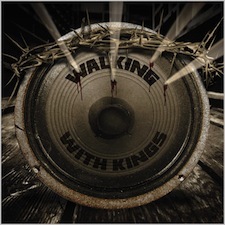 Walking With Kings' opening track "Mention of Your Name" rocks right from the very first riff, then goes into more of a laid-back pop groove. The chorus is catchy, yet inspirational, and I can't help but think of Jon Bon Jovi when I listen to Terry Chism sing. His vocals are crisp and clear, especially during the spirited "Hallelujah" part of in the song's bridge. The second track, "Here I Stand", is quite a bit heavier and faster than the first. It prominently features keyboards, and the synth sound makes me imagine bombastic strobe lights. "Here I Stand" contains some muffled vocal effects, but there are some killer crystal clear notes that Terry Chism holds out--especially during the last part of the song. "Leap of Faith", the first single the band promoted with a video online, has a bluesy rock intro riff courtesy of Rich Ward and contains a wide vocal range from Terry Chism. What I really like about this song is how the "ballady" Dennis DeYoung type vocals contrast with the hard rock guitar instrumental, and not to mention the rapid drumming from Frank Fontsere. "Leap of Faith"--which is about taking chances to change for the better--is hugely inspirational, and the extensive "na-na-na's" make it so much fun. "Autumn Brings" is definitely a divergence from the upbeat track "Leap of Faith" that comes before it. It begins with an operatic sounding choir that features a low, looming voice that subtly infiltrates the rest of the song. Instrumentally, the low, heavy guitar tone from The Duke complements the keyboards very well. "Autumn Brings" has a dark and ominous feel that isn't present on the rest of Walking With Kings, but it is inspiring nevertheless. There are two VERY different renditions of the song "Home" on Walking With Kings. Both have the same lyrical content about being small and humble compared to the enormous love offered by Jesus Christ. The title "Home" itself refers to Heaven--and having to spend a long time on Earth before getting there to experience its peace. The electric version of "Home" is very much an upbeat, guitar-heavy rock song like "Mention of Your Name" and "Leap of Faith." The vocals are often big and theatrical (more so toward the end), which I really enjoy. Also, the backing vocals sound really cool as the word "home" is sung. The other version of "Home"--which is the "unplugged" version--is the last track on the album. It boasts only a piano and vocals, with a subtle orchestral string arrangement hiding in the background. This song is truly beautiful and stunning, and it is a deep and emotional finish to such a lively album. As a long time fan, I was pleasantly surprised when I found out Rich Ward was taking part in a Christian music project. Oftentimes rock 'n' roll and Christianity are at odds, but the band Walking With Kings really beats those odds. Never once while listening to this album did I ever get that "You're going to Hell because you listen to Slayer" vibe. Walking With Kings' debut album is filled with some solid rock songs that are exceptionally inspiring without being preachy or sanctimonious. I highly recommend it to rock fans who want some honest, spiritually uplifting music with a hard rock edge.